I admit to a long-standing fascination with vampire lore, which first started from childhood stories and movies about the pontianak. Back then, nothing could be more terrifying than a pontianak; but now, they seem to be sad creatures. According to old Malay folklore, women who die during childbirth were thought to turn into pontianaks if the proper rites and rituals were not observed. 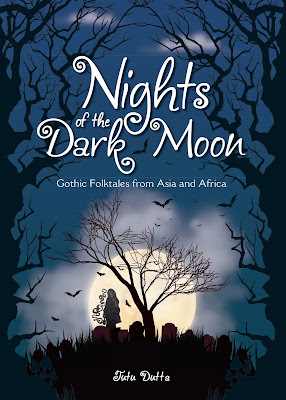 The modern variant of the pontianak folklore however maintains that they are the vengeful spirits of women who have been spurned in love and have taken their own life or women who have been murdered by their spurned lovers. I vaguely remember that one of these funerary rites involved keeping an overnight wake to make sure that no cats (especially black ones) came anywhere near the body to awaken the spirit! The worst thing that could happen is for a cat to jump over the body as that will cause it to raise and walk among the living as one of the undead (in cultures as far-flung as Ancient Egypt and Thailand and also the Slavic countries, cats are thought to carry the spirit of the dead). Not surprisingly, pontianaks are attracted to houses where a woman is about to give birth. They apparently feed on the blood and after-birth. To thwart the pontianak, it was common practice in the past to scatter thorns, nails and anything sharp on the ground below the houses (in the past, wooden houses were built above the ground on stilts). The modern-day pontianak however, prey mostly on men - as they seek out those who wronged them in life! 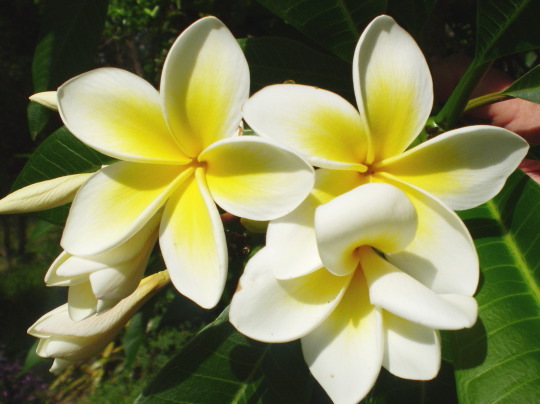 the frangipani (Plumeria sp), also known as champa in Laos and India, and bunga kemboja in Malaysia. This seems to be the ideal candidate as the frangipani is thought to be haunted by ghosts and demons in local folklore and often planted in cemetaries. 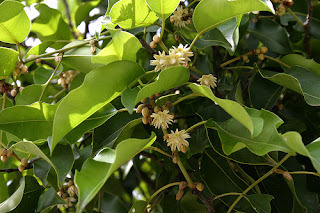 But it is also known as the Temple Tree in Sri Lanka and often planted around Buddhist and Hindu temples. But the spanner in the works is that the Plumeria supposed to have originated in the New World! Apart from that, it has large sparse leaves - hardly a place for a creature of the night to hide. We had a large frangapani tree growing in the front yard of the house when we were living in Federal Hill, Kuala Lumpur but I never felt any supernatural energy from the plant! 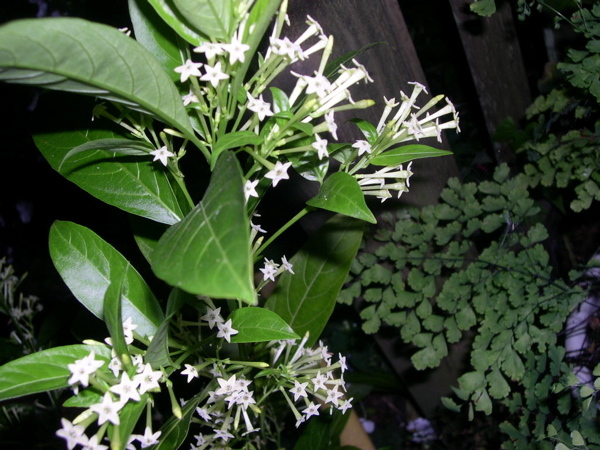 ﻿﻿﻿﻿﻿﻿The next candidate is the night jessamine (Cestrum nocturnum) also known as the Queen of the Night. The night jessamine seemed to have all the right attributes - a tree bearing large quantities of small white flowers which produce an overwhelming sickly sweet frangrance at night. But then again, it turns out to be a New World plant. Also the night jessamine is more of a large bush than a tree. Another flowering tree of note which is found throughout tropical Asia and Southeast Asia is Mimusops elengi. Known as the tanjung tree in Malaysia/Singapore and bakul/vakul tree in India. 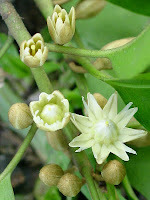 The tanjung flower or bunga tanjung appears frequently in Malay folklore, sometimes to represent a lost lover. 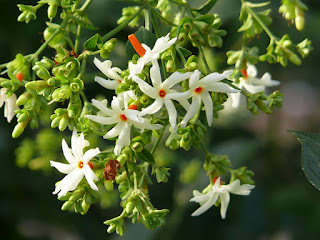 There is an enchanting folktale about the tanjung flower, which like the parijat, is sweet-scented, blooms at night and is shed at the first light of dawn. According to the folktale, the flowers are actually the tears of a faerie, who was stranded in the forest because she was unable to find her magic selendang (a long scarf) which allowed her to return home. Similar folklore of stranded faeries (usually because someone has hidden her magic cloak) appears in many Asian cultures, from India to Japan. 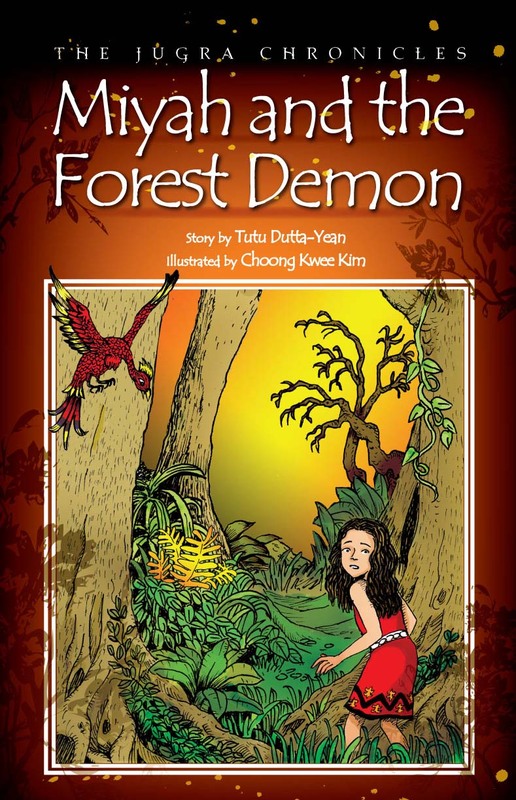 There is a re-telling of the Tanjung Blossom Faerie in my book, Timeless Tales of Malaysia. But the tanjung or vakul is the exact opposite of the sundal in folklore. It is considered as sacred by the Hindus and its frangrant 'flowers of paradise' are offered to both Vishnu and Siva as offerings. The flowers are also said to chase away evil spirits, unlike the sundal which is supposed to attract ghostly spirits! My knowledge of Western vampire lore initially came from old Dracula movies played so menancingly well by Christopher Lee. But I admit to watching only one or two of those - there was just too much blood and the plot/story lacked finesse. I think Stephen King wrote a couple of books on vampires but his premise didn't make sense either - what was the point of turning an entire town into vampires if your main source of food happened to be living humans? Talk about eating yourself out of house and home! It was Anne Rice and the movie that resulted from her book, Interview with a Vampire, who got me well and truly hooked into the genre. Finally, vampire lore that made sense - a small and very secret group who achieved immortality through an ancient bloodline; a vampire king and queen from ancient Egypt (see Queen of the Damned starring the tragic Aaliyah and the gorgeous Stuart Townsend). However, my favourite vampire movie to date is Van Helsing; Peta Wilson also plays an extraordinary vampire in the role of Minnie Harker (a character from Bram Stoker's book Dracula) in the movie, League of Extraordinary Gentlemen. But what got my pulse racing was the discovery that Count Dracula, a character created by Bram Stoker in his book Dracula (published in 1897) was actually based on a real person. Vlad Teppes or Vlad the Impaler, from Transylvania (in modern Rumania) whose father took the family name 'Dracul' which means 'dragon'. This information also triggered another memory... Malaysia's very own legend of Raja Bersiong or the Fanged King (for more info on Vlad Dracula and the Fanged King refer to the post on Raja Bersiong).